No matter what country you are travelling in, visiting it’s national parks is always a privilege. 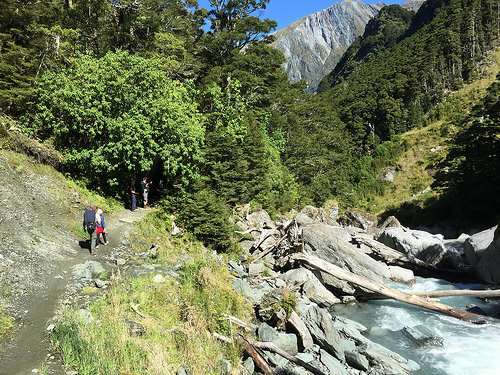 Recently, we experienced the true ‘wow’ factor – a personalised tour of the Rob Roy Glacier Track at Mt Aspiring National Park. Thanks to some forward-thinking individuals, we have these remarkable landscapes available to us which make us appreciate what an incredible planet we live on. New Zealand is home to no less than 13 national parks. Almost 30 percent of its land area has some degree of protection by the Department of Conservation (DoC). Even though it’s a small country, this is a truly unique arrangement which is difficult to find elsewhere in the world. It’s the reason why New Zealand is home to such pristine nature experiences, which travellers will happily spend days of air travel to encounter. 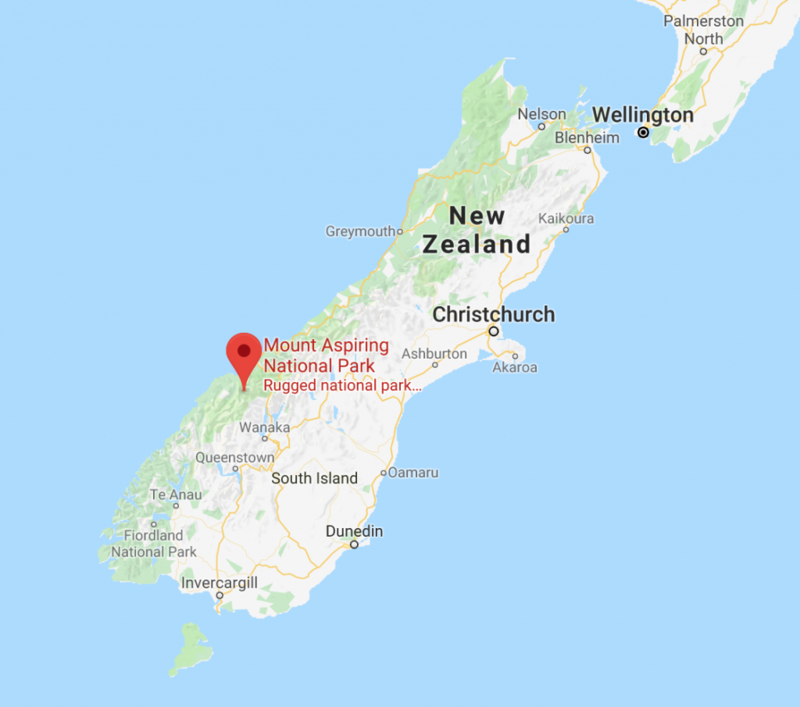 Mt Aspiring National Park covers an area of 1,375 square miles. Its located deep in the Southern Alps of New Zealand’s South Island, straddling the mountain divide between the Otago and Westland regions. It’s the third-largest of New Zealand’s national parks, and also the least developed. Here, you will find a stunning variety of different scenery; alpine lakes, mountains, native forest. It truly is a walker’s paradise, and is a great stop on any journey. Most famous of all is the Park’s glaciers – it’s home to over 100 glaciers, some of which are in easier reach than you might imagine. 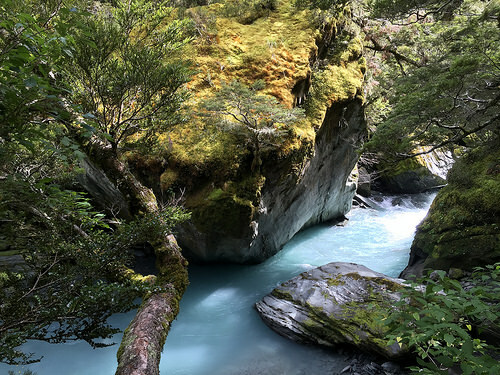 The Rob Roy Glacier walk is one of the jewels in the park. 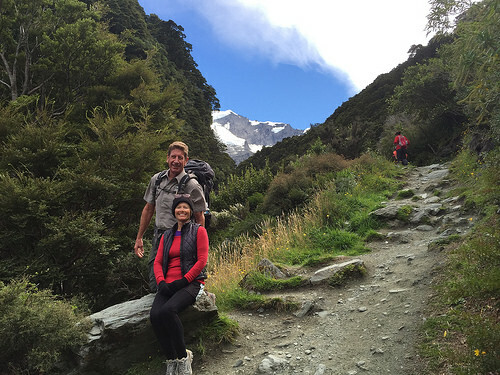 If you can only spend one day at Mt Aspiring and want a good sense of its offerings, this walk is the way to do it. 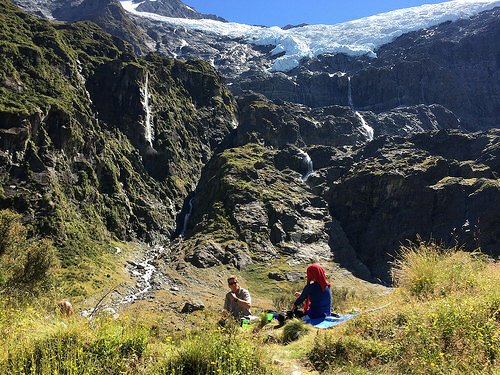 During the 4-5 hour walk you will see magnificent alpine views, tumbling waterfalls and close-up views of the Rob Roy Glacier. 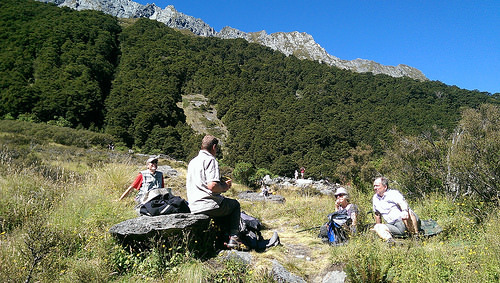 Eco Wanaka Adventures offers a full-day guided walk to the Rob Roy Glacier. All of their guides are extremely experienced, full of knowledge on amazing rest stops and photo opportunities that they are keen to share. For those who are interested in conservation efforts, it’s invaluable to be able to get this inside view. The tour leaves from Wanaka, undertaking a scenic drive up to the Park that takes you through the backcountry on an unsealed road, and into another world entirely. There was just one other couple on our tour. Like us, Bob and Sue from Yorkshire England were enthralled by the scenery. 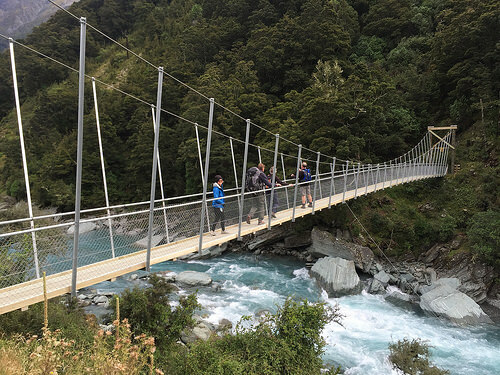 After a brief toilet stop at the car-park, we took a short 15-minute walk to the beautiful swing-bridge crossing the Matukituki River. 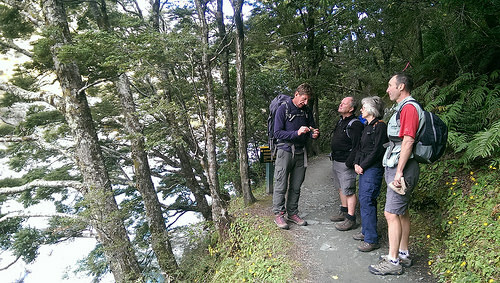 This is where the Rob Roy Glacier Track starts proper! This photo should give you some idea of how steep the walk can be in parts. A good level of fitness level is required, but there are plenty of stops on the way. Make sure that you bring a sturdy pair of walking boots! You won’t notice an increase in your heartbeat until the first real close-up of this spectacular mountain glacier. I’m sure it was the purity of the mountain air that kept me going for the last half hour up to the Rob Roy Glacier! I couldn’t resist touching the soft green moss growing in this alpine forest. It’s an expression of just how pure the air is there. As we were overtaken by a group the independent hikers trying to break the speed record, I couldn’t help but wonder how much they were taking in. 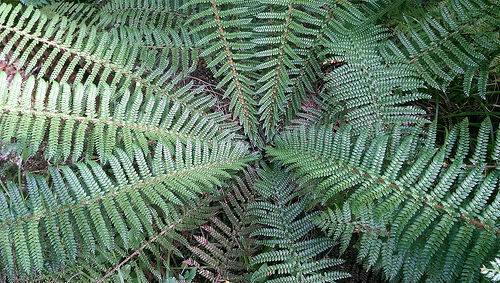 Would they remember the intricate beauty of this fern? Don’t feel any pressure to rush this walk; the enjoyment lies in taking in every moment. Al promised us an even more spectacular view around each corner. Just when I thought it couldn’t get any better, it did! When the gob-smacking moment arrived, we were all stunned. Believe me, this photo does not do it justice. A full and wider view would reveal five waterfalls shrouding the rocks in a misty spray. 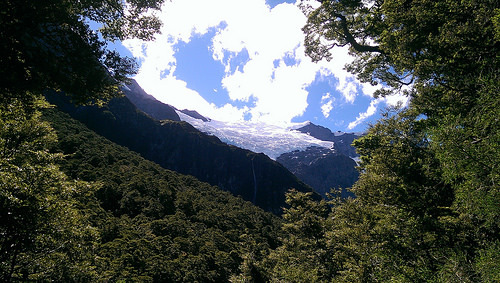 The Rob Roy Glacier is much bigger than it looks here, and sparkles under a full sun. At our carefully chosen picnic stop, Al unpacked a generous lunch of sandwiches, muffins, biscuits, fruit, juices, coffee and tea. Magic! 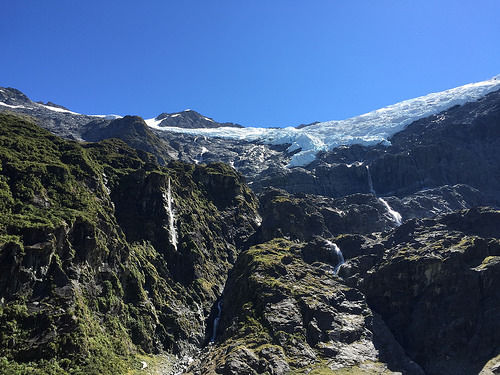 Anywhere else in the world, you’d be hiking for several days to see all something like the Rob Roy Glacier. In New Zealand, all it takes is a day! This is part of what makes this country so unique; you have so many varied landscapes and scenery in the space of just a few hours. This is the true paradise for any traveller! Even if you are short on time and can’t make the ideal six week trip through the country, there are still so many things you can experience. What made this guided walk so special? Al, our guide and the fabulous couple we shared the day with. But most of all, the prize goes to the spectacular scenery that surrounded us. It was a real privilege. Best times of year to visit: The summer months (December, January, February) are the warmest and driest months within the Park. You will often hear the saying ‘four seasons in one day’ during your visit to New Zealand, and Mt. Aspiring National Park is no exception. As an alpine environment, the climate is especially volatile. You honestly need to be prepared for anything that could get thrown at you – this includes snow flurries in the middle of the summer! 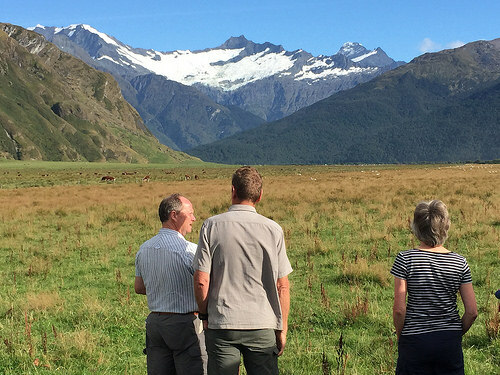 For more eco and nature tours of this kind in New Zealand, see our specially curated Nature and Lifestyle itineraries. Great write up Pam – what a wonderful experience. Tell me though, I always thought the hike actually took you onto the glacier – is this a different hike, did you stop earlier or has the glacier actually receded that much….. ? Either way I’m doing it! Hey Jan if you want to go onto the Rob Roy glacier,you actually have to fly up there.The Rob Roy glacier has receded but not to the same extent as some of the West Coast glaciers. You’ll love this hike but try to do it on a sunny day.